Perfect for the classroom here are 14 candy free printable valentines. Great for schools that have the no candy or healthy treats only rule. Many of these candy free printable valentines are allergy friendly. Print out the valentine and pair it with the candy free treat. This one is super easy and I know my kids love to eat these and love to share their favorites. By Valentines day my kids are digging through the junk drawers and cabinets because they do not have pencils any more! I have also heard from other parents that by Valetine’s day the pencil well has run dry. Why not fill it up! Apple sauce is another favorite of mine and my kids too! 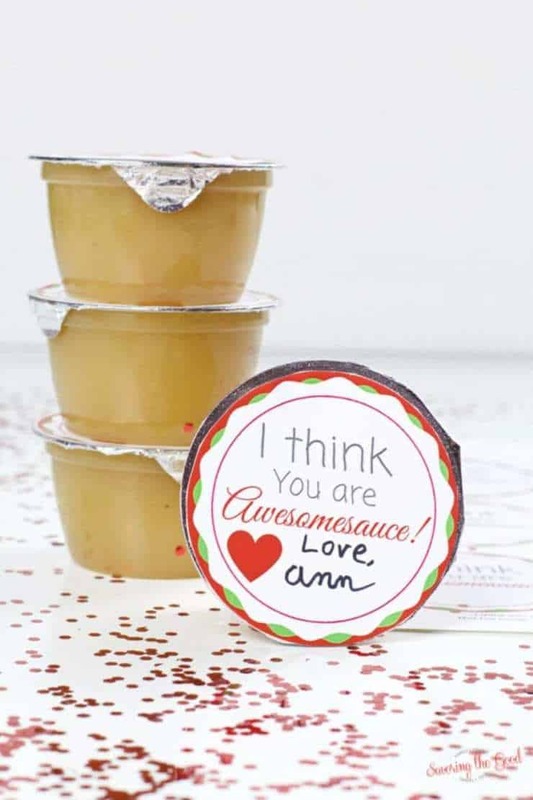 Just grab some applesauce cups from the store, slap the free printable on and you are ready to hand them out! This is a great one if the people you are giving them to are around the elementry/preschool age, but you can’t forget about your middleschooler/highschoolers because you never know when you need to relive some of that stress. With the winter season on the down slope you wouldn’t think to give socks as a valentine, but you never know if there is going to be a blizard and you need an extra pair of fuzzy socks. Lots of little kids love legos because they are using their hands. Just make sure that if you are giving this present to preschoolers that they don’t swallow the small pieces. I love gifts like this that will last more than a day or two And my kids love them because…well…they are just fun!! Things that are just going to add to everyones clutter are never good. Especially with the cold season far from over tissues are always a must!! I love crafts that are simple but get the job done. This printable does just that! These Balloons are supper inexpensive and super fun for kids of all ages! Durring the winters I miss the sounds of frogs croaking in the back woods. Well summer is almost here, but until then I can remember those warm nights everytime I give one of these frog valentines! Everybody love emojis, so why shouldn’t you share the emoji love? And with so many different options why not give them out? These army men remind me of when my little boy was all over the Toy Story movies. He had his buzz and woody, but he loved launching the army men down the slide and lining them up. I am sure this will bring back all sorts of memories for everyone.